Mark Twain once wrote that when Benjamin Franklin wanted to fly his kite undisturbed on a Sunday, he used to hook a key on his kite string and tell any scandalised onlookers he wasn’t breaking the Sabbath, but rather ‘fishing for lightning.’ Reading for The Best Australian Poems 2017 feels very much like Franklin's fanciful hobby. You tell everyone how arduous and serious the job is, but secretly you spend your time joyously rummaging through journals, magazines, anthologies, individual books and submissions, compiling a long list of your favourites. Of course, the difficult part swiftly follows: you have to shave all those poems down to a tidy hundred. At the end of the process, though, I’m thrilled by this year’s haul. A few special highlights for me are Barry Hill’s moving elegy for the late great poet Fay Zwicky, which lands on the beautiful afterimage of Zwicky’s voice, ‘the old smoke still roiling in it’, Maria Takolander’s wonderfully spiky ‘Nox’, in which a wife composes a poem during a husband’s stint anaesthetised in the ER, and Jaya Savige’s exuberant echo-chamber ‘Fort Dada’, where language doubles in on itself in a serious of skilful refractions. There are more such favourites, of course – many more – and I hope readers will enjoy fishing for lightning in this year’s anthology themselves. Robert Adamson, Jordie Albiston, Cassandra Atherton, Luke Beesley, Judith Beveridge, Judith Bishop, Kim Cheng Boey, Ken Bolton, Peter Boyle, Margaret Bradstock, Lisa Brockwell, David Brooks, Pam Brown, Joanne Burns, Michelle Cahill, Lee Cataldi, Julie Chevalier, Eileen Chong, Jennifer Compton, Stuart Cooke, Shevaun Cooley, Judith Crispin, Sarah Day, Shastra Deo, B.R. 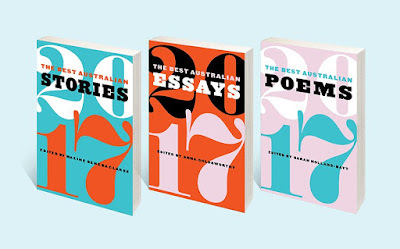 Dionysius, Lucy Dougan, Laurie Duggan, Adrienne Eberhard, Ali Cobby Eckermann, Stephen Edgar, Anne Elvey, Russell Erwin, Diane Fahey, Michael Farrell, Susan Fealy, Liam Ferney, Luke Fischer, Toby Fitch, John Foulcher, William Fox, Angela Gardner, Lisa Gorton, Phillip Hall, Natalie Harkin, Jennifer Harrison, Dimitra Harvey, John Hawke, Dominique Hecq, Paul Hetherington, Barry Hill, Andy Jackson, Clive James, Carol Jenkins, A. Frances Johnson, Jill Jones, Rae Desmond Jones, Amanda Joy, Carmen Leigh Keates, Antigone Kefala, John Kinsella, Louis Klee, Mike Ladd, Anthony Lawrence, Bronwyn Lea, Jeanine Leane, Emma Lew, Cassie Lewis, Bella Li, Jennifer Maiden, Caitlin Maling, David McCooey, Peter Minter, Marjon Mossammaparast, Philip Neilsen, Geoff Page, Claire Potter, Ron Pretty, Brendan Ryan, Gig Ryan, Tracy Ryan, Philip Salom, Jaya Savige, Michael Sharkey, Melinda Smith, Vivian Smith, Maria Takolander, Heather Taylor Johnson, Andrew Taylor, Tim Thorne, Mark Tredinnick, Todd Turner, John Upton, Chris Wallace-Crabbe, John Watson, Alan Wearne, Petra White, Jessica Wilkinson, Chloe Wilson, Fiona Wright and Fay Zwicky. Painter, comedian and author Anh Do has won the 2017 Archibald Prize ANZ People’s Choice Award for his portrait of Jack Charles. The artist interviewed and painted the actor – whose recent roles have included Uncle Jimmy in the ABC TV sci-fi series Cleverman and his stage production Jack Charles v the Crown – on his popular ABC show Anh’s Brush with Fame. The portrait is a vivid depiction of the actor, whose tumultuous life story was told in the 2008 documentary Bastardy, with hidden surprises – or Easter eggs – that reveal themselves on closer inspection. “I feel very lucky that Jack let me paint his portrait for the Archibald prize. He’s an extraordinary Australian with a great face full of character. Jack has lived a big life and I enjoyed getting to know him and painting his portrait immensely,” Do said. nb: I couldn't supply an image, and for this I apologise.